Because I’m a tragic Internet Marketing junkie and I just have to try all the damn products, I recently went through a product called Free Traffic Achievr. 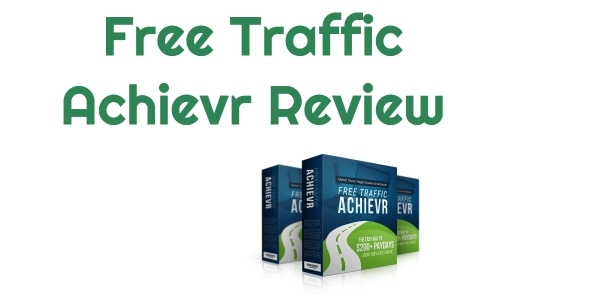 So I’ve gone through it, and here is my Free Traffic Achiever review – don’t get it without reading the whole review and checking out my bonuses! Free Traffic Achievr – what is it? Free Traffic Achiever is a new product available on the Warrior Plus website. It is authored by a truck driver turned internet marketer named Kal Bartal. He came across a method for generating commissions from completely free traffic and made a course based on it. Free Traffic Achievr is a video training course that teaches a method to get free traffic to affiliate offers. You then hopefully get people buying those offers, and make some money, by earning commissions. It is actually a very simple and genuinely newbie-friendly system. In fact, I would say it is the easiest system currently out there. The course is quite short – almost a little too short. Like I said, this is a very basic system. If you are new to internet marketing and don’t have time to learn WordPress or technical skills, this could be a good program for you. It doesn’t require you to start a blog, make Youtube videos, or anything involved like that. You can probably get started in just a few days – though you might not see results like those posted on the sales page for a little while longer. It also comes with PDF versions of all the lectures, which I really like. Sometimes I can digest things much quicker via reading than watching videos. So you can choose videos or PDF, depending on how you like to learn. Or just watch the videos and then do a check or refresher with the PDF documents. I actually wish more internet marketing courses did this! Maybe they should learn a lesson from this course. Free Traffic Achievr – who is it for? Free Traffic Achievr Kal Bartal – in his former life as truck driver, before he became a successful entrepreneur! This product is for people pretty new to internet marketing, who want to start off with a simple low-risk method, free traffic. Like all systems, you have to put in work. And you might not see the results posted in sales page screenshots right away. But if you put in the effort, you could get there, I’m sure. If you’re more of an advanced marketer, especially in regards to social media, then Free Traffic Achievr may not be very valuable for you. But does the Free Traffic Achievr really work? I am actually already using many of the techniques shown in Free Traffic Achievr, so it’s hard for me to say if they specifically work. But since I’m already using a system that is basically the same as the one taught here, and it’s getting me results and commissions, I could be confident saying it could work for you. This is a good basic course that works well as an introduction to internet marketing. The only drawback I can think of is that the course is quite short – I think they could have gone into some techniques in a bit more detail. However, I have to say, they were really generous with the bonuses. Achievr comes with a big pile of vendor bonuses straight out the box – an entire video course on Ecommerce (they could have charged $10 just for that! ), an ebook on Instagram profits, a cool ebook on product authoring called Shoestring System, and a pretty good guide to Facebook advertising called Tidalwave Traffic. These bonuses alone are worth the price of the product! Free Traffic Achievr is a good entry-level product for internet marketing newbies who are just getting started. It is priced very cheaply (I bought it at $8, as of writing it has now gone up to nearly $10, so if you are going to buy it I would do so now before it goes up more). And it comes with a big generous pile of vendor bonuses, so you might want to check it out! “Tidalwave Traffic” Facebook ads ebook. “Viking” Google Ads ebook and video course (worth $27). These bonuses combined alone are worth well more than the price of the course, so this one is a no-brainer! Get Free Traffic Achievr now.